Conclusion: We come out on the short side of HBI into the quarter. Growth will start to decelerate, and we’ll get a transparent look into the real operation here – which shows more risk than reward. 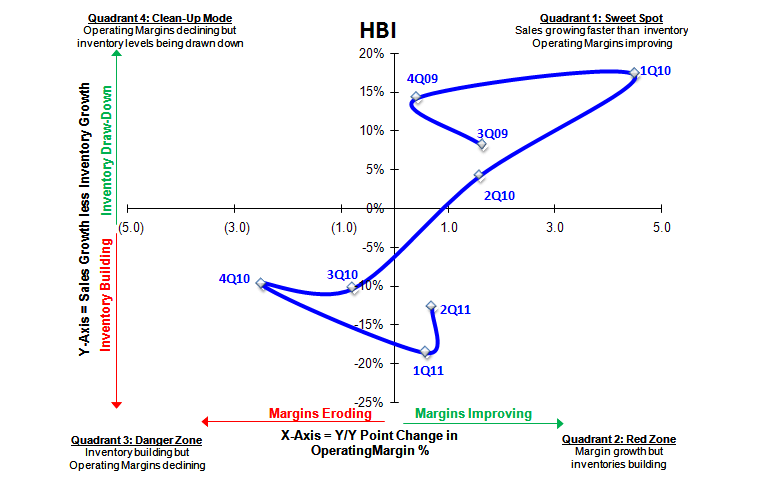 We expect the crack in HBI’s top-line trajectory that started to show in Q2 will become increasingly evident this quarter. HBI is now facing four straight quarters of double-digit comps and +11% and +16% over the next two quarters. Q3 will be propped up by incremental Gear For Sports revs (+7%), but shelf space gains and unit growth are likely to slow. After November 1st, HBI anniversaries the GFS deal at which point HBI becomes more reliant on further price increases. That’s the same time when JCP is looking to get sharper on pricing heading into 2012, which we expect to be the start of a nasty price battle at mid-tier department stores. HBI’s top-line is destined to decelerate back into the single-digits barring more deals – yet the company is still being valued as a growth company. Increasingly bearish reports out of the department stores since HBI last reported suggest Q4 sales expectations might be lofty, which could lead to an adjustment in the company’s Q4/FY outlook. Despite slower sales growth expectations, we think margins will still expand with SG&A leverage offsetting continued gross margin headwinds as the remainder of higher cost cotton cycles through. Lower top-line equates to lower earnings. While consensus has come down $0.02 to $0.62 over the last few weeks, we think it has to come down more than that – we’re at $0.52. The reality of top-line growth reverting back into the single-digits requires CEO Rich Knoll to realize that this is not a growth company. Either he’ll start managing the business for maximum cash flow, or we’ll see the company lever up and buy more growth. This is the biggest risk to the story and with prior CFO Lee Wyatt no longer there to protect the balance sheet, one that has become increasingly likely. We’re shaking out a penny shy of Street estimates for $0.82 in Q3, but are lower in Q4 ($0.52 vs. $0.62E) due primarily to lighter sales expectations. European Risk Monitor: At the Halfway Point? No Chance.